Category: Flexible - Form Fill Seal. Automatic For Higher Thicknesses & Bag Material Compositions Heat Sealing may be done in two – three Steps. The majority of today’s pouch applications in the pharmaceutical and veterinariansector are typically high output productions of flat pouches with powder products in single doses.Over the years BOSSAR has developed the technology that can offer precision filling, and can adapt to the specific characteristics of the product to ensure a quality pack. Our aim is that our business keeps growing within the pharmaceutical and veterinarian sectors. 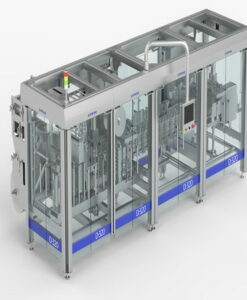 To meet the requirements of this demanding sector some of our machine models have been specifically designed to meet the hygiene standards of the pharmaceutical and veterinary industry and as a result BOSSAR has been able to become familiar with the high demands of this market. We have standardized many of the protocols within our business and can offer a complete service of DQ, OQ, IQ and FAT validation procedures. On the other hand, the characteristics of the cosmetic industry applications are small doses of liquid or creamy products and special shapes – inherent qualities in a demanding environment with the need to present higher added value products in a premium package. This has made us specialists in the technology of micro-dose filling such as shaped punch die systems and very high quality seals for insertion of sample pouches into magazines. One of the most challenging applications Bossar has undertaken is an aerosol application where the precise positioning and sealing of the aerosol valve piece into the pouch was critical to give the aerosol manufacturer a total guarantee of a quality finished pouch product. This was achieved thanks to our innovative mechanical design as well as to our selection of optimal materials to evenly transmit the seal temperature. We are aware that most applications consist of emulsions and delicate products. We therefore carefully select the correct filling systems as well as dispensing nozzles to suit each and every product type.